Jaromir Zaoral and his EU Peaks Expedition. He will climb the highest mountain in each of the member countries in the European Union over 77 days. Among the many grant applications which we receive a significant number are rejected. Some do not make the cut because the applicants do not meet our charitable objectives; others for nationality reasons. That is, we are restricted by our charitable covenants to helping young people only in the UK. In the mix however, we do come across some genuinely exciting, interesting and challenging expeditions. One such is Swedish based Jaromir Zaoral's EU Peaks Expedition on which he will climb the highest peak in every EU country over 77 days. He kicks off tomorrow and we wish him luck. You may follow his progress here. He will be worth following for he is a heck of a good photographer. We're expecting to see some familiar views. Incidentally, how many have you climbed? This is a post that has taken far too long to write, but given the enduring nature of events it is just as relevant now as when I meant to write it over a week ago. One of the most heartwarming experiences of our expedition was the overwhelming hospitality and generosity of the very many people we came across along the way. So many people helped us out, took us in for a night, fed us, replaced broken kit, bought us a drink, gave us advice or just stopped to say hello that we both felt unbelievably humbled by the kindness. We also know that these experiences were not exclusive to our expedition but are a welcoming respite of explorers and travellers visiting new communities across the world. There is something special about the island communities. The 'Island Factor' is very real and very strong. For example, after kayaking 50nm (casting off at 1am) from the Turks and Caicos through a rather breezy stretch we landed on the Family Island of Mayaguana - our port of entry into the Bahamas. After checking in at the customs office we made our way back down to the beach to start setting up our hammocks for the night. Soon after, a local walking along the beach asked what we were up to and after we had finished explaining insisted we could not possibly stay on the beach - "yeel be eaton alive mon" - and took us in, gave us dinner, a bed and sent us off with breakfast in the morning. 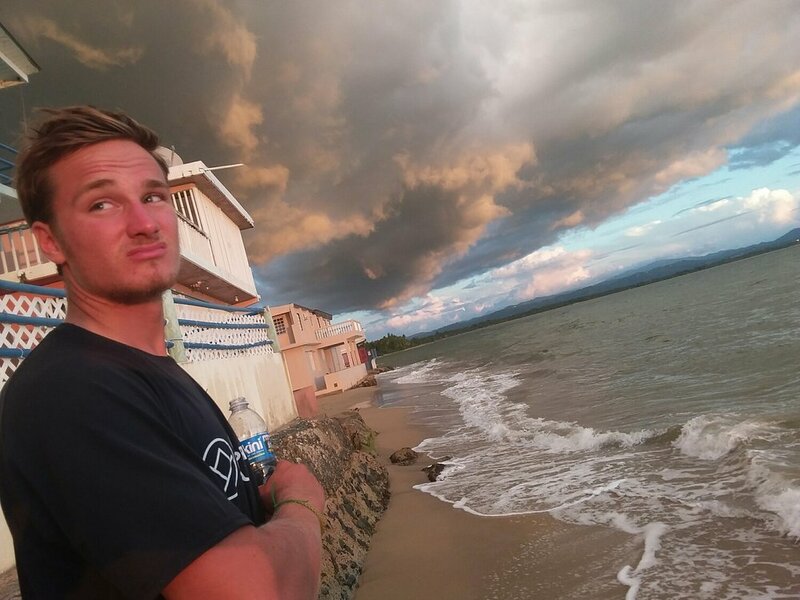 He lived in a one bedroom bungalow with very little income but did not think twice about pulling us off the beach and ensuring we were well taken care of. The Bitter End, who very kindly let us stay after crossing the Anegada Passage, was devastated by Hurricane Irma. 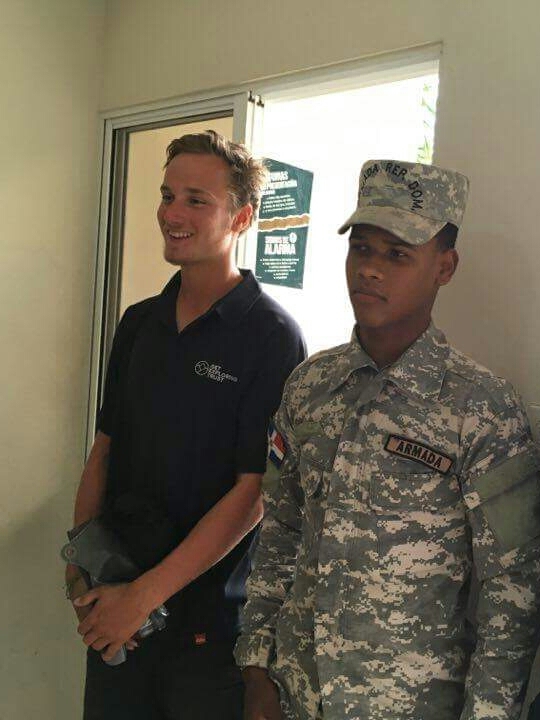 Nanny Cay, who took very good care of us in the BVIs as well as replacing lots of our damaged and lost kit, despite suffering a lot of damage, have now taken in the HQ for the British Forces who have delployed to the islands to help with the relief effort and maintain order through this difficult time. As Hurricane Maria develops and develops into another Category 5 storm, our thoughts are with you all. Well, you haven't heard from us in a while and we hope you can probably understand why! It is now time, however, to go back to the final crossing and let you know what happened in the final couple of days. We were positioned on Cat Cay, 8 miles South of Bimini in order to give us a fighting chance against the infamous Gulf Stream. A mass of water greater than all the worlds rivers combined flowing North at between 1-6kts (although some people advised us it may reach 8kts). 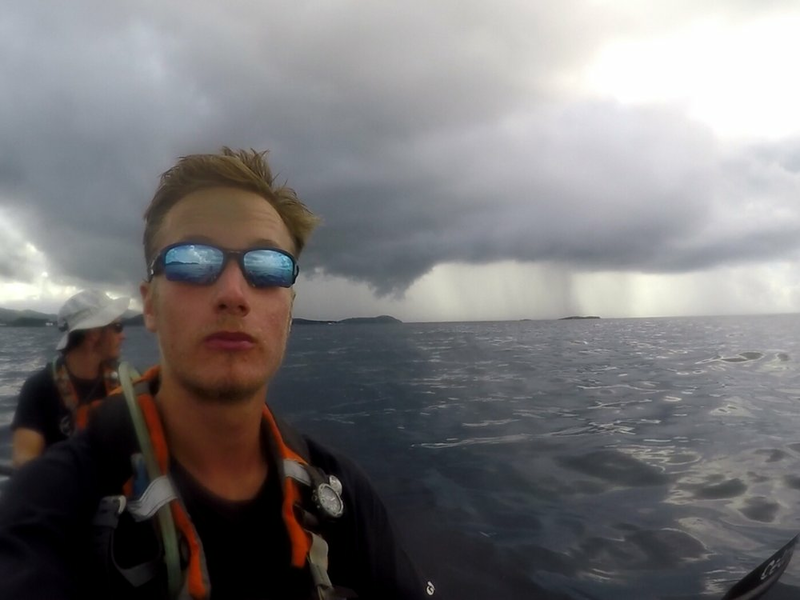 After a 60 mile crossing from our uninhabited island off the North coast of Andros Island to reach Cat Cay on Christmas eve our plan was to rest up Christmas Day and set off at around midnight for our final crossing. Fully packed and ready to go we were just 2 hours from departure when the bombardment of messages came through. Will's dad back home had been on the phone to the US Coastguard explaining our planned crossing. 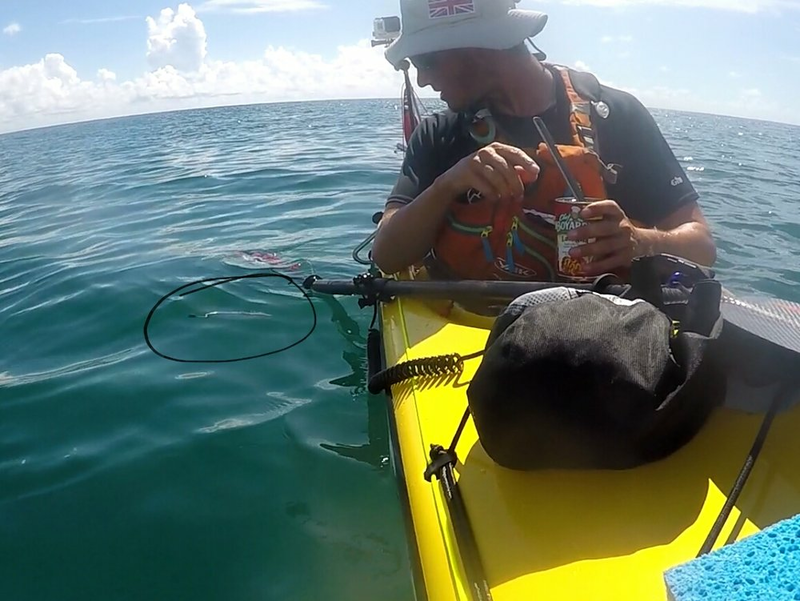 This was routine procedure, despite the fact that the coastguard was non existent in many of the islands, we would always try and alert them to the two crazy guys paddling their way in a kayak . The Americans took this slightly more seriously than all the other coastguards. We were strongly advised not to set off that night, alerting us to the daunting fact that by the time they reach the approximate location of a distress call their search area is the size of a US state. This was the general rule for a yacht/ pleasure cruiser. Searching for a small kayak bobbing in the waves at night would be next to impossible to locate. On top of this a small craft advisory warning was in place. 'Issued when winds have reached, or are expected to reach within 12 hours, a speed marginally less than gale force'. Although incredibly frustrating, with the weather updates coming in and the information from the Coastguard, the decision not to cross became a no brainer. So we turned our hopes to boxing day night. The pristine beaches and glistening water were no longer a relaxing sight. After 3 months of longing for the next rest day (admin day) we were now utterly sick of being stuck on land. The weather wasn't letting up and the small craft advisory was still in place until the morning of the 27th. We spent every 10 minutes of boxing day checking our list of weather stations. Lengthy discussions with the US Coastguard ensued and finally we were given a slight approval to cross. They advised us to wait until daylight but this was impossible given the length of the crossing. The small craft advisory warning would stay in place but we knew we had paddled in worse weather than what we would face. We sat down for our final dinner, the wind was blowing and the nerves were building. The concerning factor was the countless captains and yachtsmen we met that night. We had heard so many stories of the Gulf Stream along the way, strong winds mixing with the incredibly strong current causing 'monster' waves. At dinner we met a couple of families who were intrigued by our story. Learning of our plans they were adamant we should not go that night. Two captains of a boat in Cat Cay had also heard of our plans and came to have a chat with us. Having flown across from Miami that day they stated that they wouldn't even cross in these conditions. It's fair to say we weren't overly pleased hearing these words. Personally and I think for Will as well the overriding emotion was immense frustration. The weather forecast was absolutely fine but we just had no idea what these 'crazy' Gulf Stream conditions everyone loved to tell us about would be like. We had spent extra money on charts, received all forecasts possible and still we were utterly clueless as to what we would face. As Midnight approached we checked any last messages, completed our final weather check and sat down to make the decision. The weather had not improved, the coastguard had left the small boat advisory warning in place until the morning yet all our weather forecasts were adding up to manageable conditions. As T.S. Eliot said 'Only those who will risk going too far can possibly find out how far one can go'. We went. 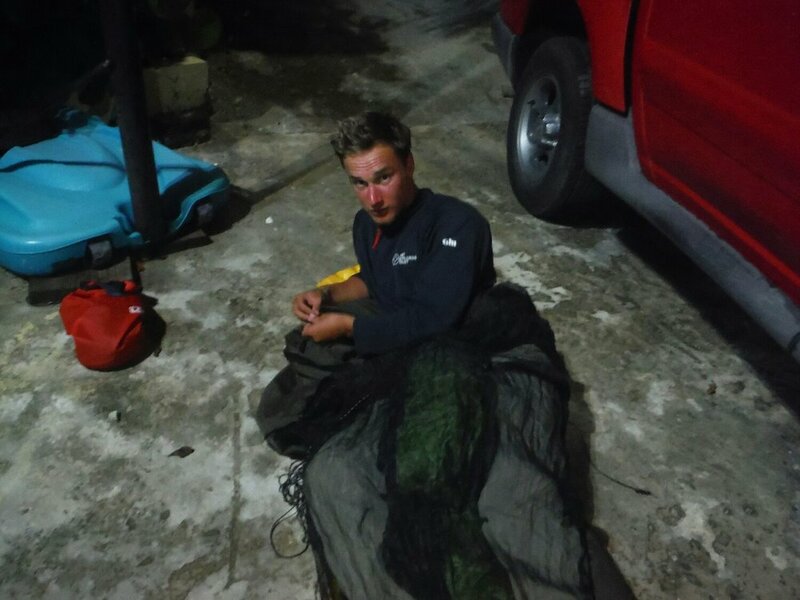 1am arrived and at last we were climbing into the boat to face the closing stages of the expedition. If there was ever a sign not to go we probably had it as soon as we set off. In total darkness and fortunately in the shelter of the marina the rudder started to play up. On the opposite side to where the rudder cable had snapped a couple of weeks earlier we were strangely barely able to turn left. Continuing on we next realised we had left our prized GB flag in one of the hatches. Unused for 3 months and waiting for our arrival in Miami we simply had to stop to get the flag out. Having only just left the marina we scanned the tip of Cat Cay with our torch to find a suitable place to land. Once landed we quickly unpacked the flag, had a play with the rudder and all was good. 5 minutes later and we were back on the water, heading into the frantic shipping lanes in the Gulf Stream. We spent the next 6 hours of darkness constantly looking over our shoulder. Fearful that one of these vessels would appear at any minute directly behind us. At this point I realise I've failed to mention anything about the weather everyone was so concerned about. If we're perfectly honest the waves weren't anything like what we had been expecting. Their size not as big as let on and the wave pattern predictable. There's no doubt the Gulf Stream in the wrong conditions becomes pretty perilous but the concern over the conditions we faced was not necessary. With our weather concerns subsiding our attention turned to the power of the Gulf Stream. Having struggled to predict how far up the coast of Florida we would be pushed we had a number of potential landing points. Fort Lauderdale being the most Southerly point and West Palm Beach hopefully being the most northerly. The power of the Gulf Stream certainly shouldn't be underestimated. Looking back on our tracker we were averaging around 6/7 knots in the middle of the stream. Consequently we made seriously quick progress. Setting off at 1am we arrived in Fort Lauderdale at 2pm on the 27th of December. Overriding emotions were probably of sheer relief. Relief that the countless dangers have finally disappeared for the last time. Sharks, thunder and lighting, squalls, dehydration, weather concerns and reefs were no longer. The strangest feeling of all, we wouldn't have to go through the daily routine we had experienced for 3 months. Well it would be fair to say that none of this would have been possible without so much help from so many people. The list is genuinely endless but a few very special mentions must be said. David McCreadie (Will's father) was simply fantastic, always keeping a watchful eye on our progress, alerting us of any ships in our area, supplying weather updates, keeping coastguards informed of our location and handling any enquiries back home. We're extremely grateful for all our financial sponsors, equipment sponsors and accommodation sponsors. Vital in every aspect of the trip. Lastly a huge thank you to everyone who has donated. Although the trip has finished work with the Get Exploring Trust has just begun and we're extremely keen for people to keep donating, promoting the charity and now choosing our charity in your fundraising activities! Life following the blue dot tracker may have ended for now but there will be so much for everyone to get involved with now we are back home. Keep an eye out for news on our talks, fundraising dinners and the premier of the film! We would love to see you all there! Well, everything has started going pretty quickly since we left Grand Turk. We made our way across the T&Cs via South Caicos and Provo before making the cheeky crossing across the 30 mile passage to the Bahamas. The aches and pains are already back and after four long days and three nights camping in the sand since our last shower the salt rashes have started to develop and our bodies are slowly wearing down. After a quick pit stop in Landrail Point, Crooked Island, where we have received unbelievable hospitality, we will be back making use of our Hennessy Hammocks in the mangroves until we reach Georgetown in a few days time. Fleeting wifi this evening has allowed us just a quick update so we will write properly when we reach Georgetown where George has promised me a rest day. Yay! The night before leaving South Caicos we were shown a video of a 12 foot tiger shark swimming in the water just a couple of miles up from where we landed. 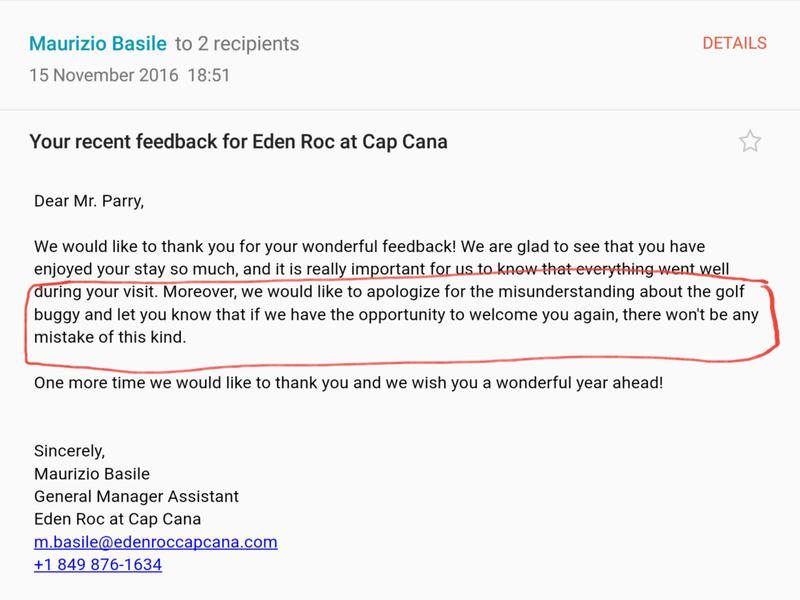 You can imagine this meant we were quite apprehensive when we left at 2am the next morning and kayaked in the dark through a small channel of water affectionately named Shark Alley. This was just around the corner from Shark Bay. You get the theme. It was a dark night, no moonlight, so we could only see a couple of feet around us and the dark water glistened ominously back at us. Despite having been tense in anticipation for the last twelve hours it still sent one hell of an adrenaline buzz when we saw a fin circling for the first time. Moments later two big shadows appeared behind us. I immediately reached for the GoPro... George gently reminded me my paddle might be better defence. But you'll have to wait for our movie for the rest of this story...!